I recently blew the front-end of my 1000MP from too much neighbouring RF during contesting (WRTC). No RX on both main and subVFO on all bands from 100KHz to 29MHz. VE7SV pointed to VA3CR' site a similar problem solved by replacing D1056 from the IF board (on MkV). As I could not locate D1056 I assumed that the MkV and MkI have different circuitry. Based on the symptoms and looking at the diagram I located D1033 (1SV196) which seems to be the only pin diode that is common on all bands. 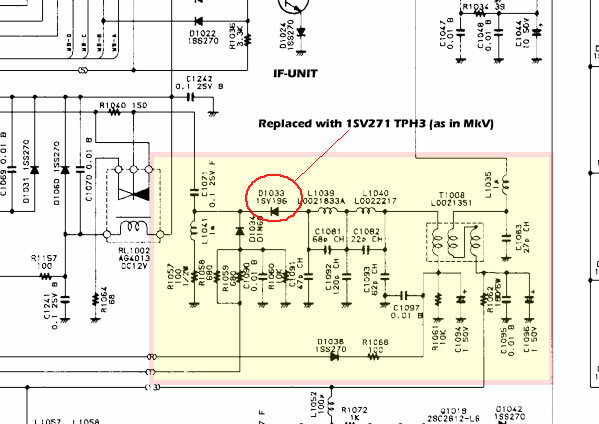 I then downloaded FT1000MP MKV technical manual and found that D1056 is the "same" diode as D1033 on the circuit diagram BUT on the MkI is 1SV196 and on the MkV is 1SV271TPH3. The circuit around both diodes is exactly the same in both radios and since I had an 1SV271TPH3 available (thanks VE7SV) I decided to change this. I opened the radio as described by OH6RX and removed the IF board. 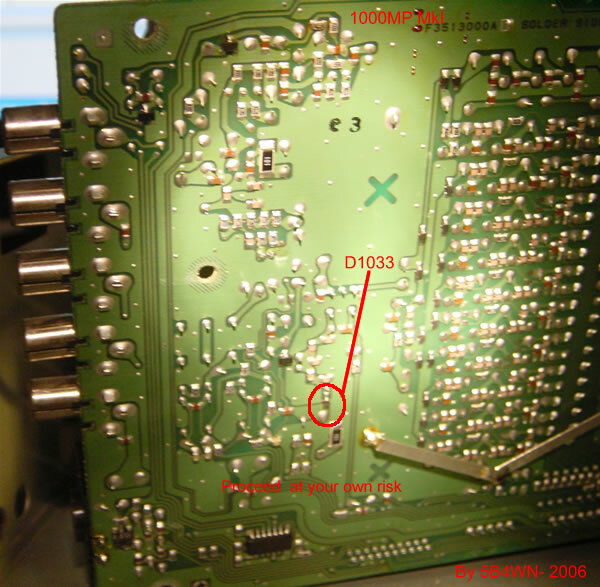 D1033 is an SMD located on the undersurface of the radio next to the leg of L1039 (see image below). I replaced it with an 1SV271 (check for correct polarity) and that did the trick! The radio is again operational!